FDA Approves Cialis To Treat Enlarged Prostate Symptoms : Shots - Health News Cialis, a popular remedy for impotence, has now been approved by the Food and Drug Administration as a treatment for symptoms of benign prostatic hyperplasia. It's the ninth drug okayed for relieving those symptoms but the only one approved for both uses. The FDA says the same pill can be used to treat BPH and erectile dysfunction. 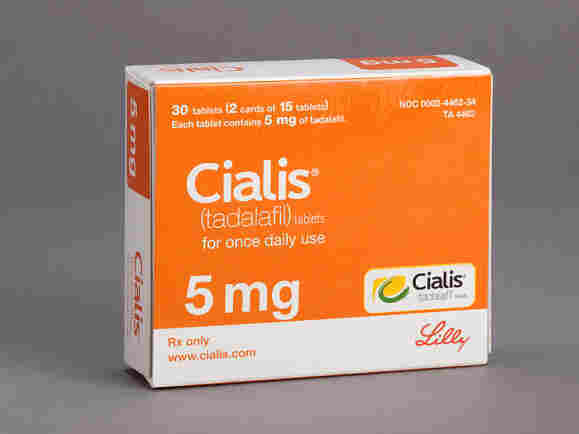 In other men's health news today, the Food and Drug Administration approved the use of Cialis as a once-a-day treatment for symptoms caused by an enlarged prostate. That makes Cialis, a popular pill for impotence, the first drug of its kind to also be okayed for benign prostatic hyperplasia. Those symptoms include difficulty in starting urination and frequent trips to the bathroom in the middle of the night. The FDA says it's the ninth medicine to be approved to help men with drug becomes the ninth approved by FDA to help men with BPH. A month's supply of 5 milligram Cialis tablets, the dose approved for BPH, costs $134 at drugstore.com. A month's supply of generic terazosin (once sold as Hytrin) for BPH costs $14.00. In two clinical studies, daily Cialis treatment lowered the score on a standardized test of prostate symptoms by almost 5 points, or around 25 percent from the starting point. In both studies the result was about twice as good as seen for men taking placebo. Another study showed improvements for erections and BPH. Common side effects include headache, stomach upset, back pain and muscle aches. Eli Lilly, maker of the pill, doesn't know exactly how the drug works to relieve symptoms of BPH. I wondered what's next for Cialis? A switch to over-the-counter status, perhaps? A Lilly spokeswoman said there's no plan for anything like that. And a generic, if you're curious is years away. Patents will protect the drug in the U.S. until 2017.